In my last post, I introduced Geek Girl Brunch and the coasters I made for our local chapter launch swag bag. Today on Geek Crafts I talked a bit more about GGB and our next event, which has a "Let's Get Crafty" theme. Geeks + crafting? So.there. Speaking of Geek Crafts, I recently updated my listing of posts I have contributed there - at 150+ posts, it's a geek-tastic extravaganza of crafty goodness! Hop on over to Geek Crafts to see the quickie tutorial I shared for creating geek ornaments from comic books! 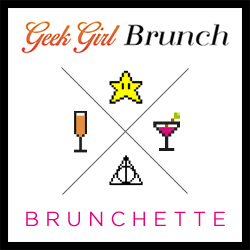 Have you heard about Geek Girl Brunch (GGB)? It's this awesome organization that nurtures and encourages geek girl meetups. Over brunch. With drinks. They started as a local meetup group in New York City, and had so much fun that they decided to roll out WORLDWIDE chapters. Sensing I had found my geek tribe, I signed up to be notified about news of the Kansas City chapter. I got an email in April notifying me that chapters were forming, and would I like to be an officer to help launch the KC chapter? Since my mantra for the year is to be open to new experiences, I said yes! I've been working for the past few months with my co-officer Amanda to get all the various elements in place - Twitter account, Facebook page/group, chapter page, deciding on logo colors, scouting a venue for our first brunch, and millions more details. We are so excited to get things rolling! To welcome our first Brunchettes, Amanda and I are working on fun little swag bags. I'm crafting a GGB-KC Brunchette tile coaster for each attendee. I have a variety of geek coasters available in my Etsy shop, but thought I would do a brief write-up on how I make them. The instructions that follow are specific to the Brunch coasters, but you can substitute any image to make it your own! The trick that makes my coasters so nice and durable is the resin coating on top - there are tons of DIY tutorials online that tell you just to adhere and seal with Mod Podge, but I didn't find that durable enough. I tried sealing the images with spray acrylic, spray polyurethane, and brush-on poly, but the images bled and I would get rings from the drink condensation. I finally experimented with resin and my coasters are gorgeous with a glossy crystal clear hard coating that works great for hot or cold drinks (duly tested with coffee, margaritas, hard cider, Captain and Coke, and plain old ice water). ceramic tiles - I get 4"x4" white tiles from Lowe's or Home Depot for about 16 cents each, or often I can find them at a Habitat ReStore for 10 cents each. Start with the basic Brunchette badge that the girls at GGB HQ have made available in the sidebar of their website. You can also use any image you like - I also like comic book pages! Using a graphic editing program (e.g. Photoshop), create a new image or resize to 4"x4" (or the size of your tile. Edit image to customize drink colors and add city-chapter name to the header. Using a desktop publishing program (e.g. MS Publisher), insert the image four times, so four images print on one sheet. Using a color printer, print as many images as you need. I print on regular printer paper. Trim each image to size (I use a paper cutter for nice straight edges). Using a small paint brush (~1/2 to 3/4"), apply Mod Podge to one tile. Cover the whole top surface. Carefully center color image on Mod Podged surface and smooth down so there are no wrinkles. Use a brayer to firmly attach image. Using the same small paint brush, brush on a layer of Mod Podge over the surface to help seal everything. Allow to dry - I usually allow at least a couple hours. Repeat Mod Podge process for each coaster. Place 7 coasters on plastic cups, with about 2" between. Put on plastic gloves and follow package instructions for mix ratio and stir time. After the resin is completely mixed per instructions, pour about a quarter to silver dollar sized amount in the middle of one coaster. Use a disposable foam brush to gently and slowly cover surface with resin. Make sure you get to the tile edges and seal in the image edges. Continue for remaining coasters - pour a small amount, one coaster at a time, and spread to cover with foam brush. Once all 7 are covered, go back and inspect for little air bubbles in the resin surface. If you see any, huff your breath lightly over the surface - the carbon dioxide should pop the air bubbles so you don't mar the surface with continued brushstrokes. Allow to dry at least 24 hours - I usually let cure for 48 hours. Adhere 4x4 squares of stiffened felt to tile backs to protect table surfaces. Protect your work surface! There will be drips and resin is a PAIN and tedious to scrape off. I tape down a plastic garbage bag so nothing moves around. Set out one plastic cup for each coaster - this will hold your coaster as you brush the resin into place. I actually progressed to using 2" wood blocks beneath each coaster, but used plastic cups to start. On the back of each tile, put masking tape around the inside border to catch any resin drips. That way you can just peel off any drips that escape, rather than laboriously scraping them off. Put on disposable plastic gloves BEFORE you mix the resin. I use wood craft sticks to mix the resin. I use 1 oz each of the resin and hardener, and mix in disposable plastic drinking cups. With this amount, I can usually do 7 coasters. If you need to do more than 7 coasters, do them in batches of 7 so the resin doesn't start to harden before you get to all your coasters. I learned a lot from reading this post on resin tips, including the comments. See also: ResinObsession.com-Resin FAQ, including What Kind of Resin Should I Use? Hope this helps other chapters with some fun swag! Have you heard of GGB? Excited to check it out? Have you experimented with resin? Let me know in the comments!